We sometimes hear people speaking about “gaps” in our scientific knowledge. People often speak as if there were merely a few cracks or gaps in our scientific knowledge, and that in the not-too-distant future those gaps will be filled in (perhaps rather like some construction worker filling in a few cracks in a wall, or like a photo restorer filling in a few cracks in an old photo). Is it correct to speak in such a way? No, it isn't. But the reason is not that our scientific knowledge is perfect. 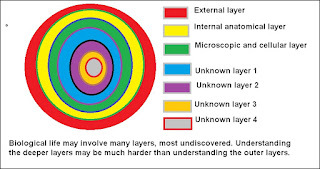 The reason is that our scientific knowledge is so fragmentary and so tiny that it is misleading to use the term gaps or cracks to refer to what we don't know. What we should be saying is that what we do know is tiny, and what we do not know is vast. Consider the current state of our knowledge. We know about the surface of our planet and a few other planets. But we live in a vast universe of billions of galaxies, many of which have billions of stars. So we know nothing about 99.99999999999999% of the planets of the universe. We also know basically nothing about most of the matter and energy in the universe. Scientists say that 96% of the matter and energy is dark matter and dark energy, which we know basically nothing about. We also have no idea what caused the origin of the universe billions of years ago. 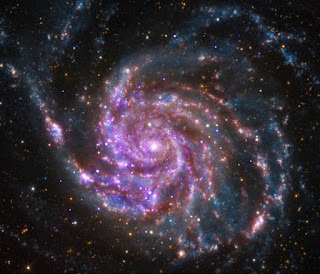 There are many mysteries regarding how we got from the supposedly infinite density of the Big Bang to the orderly state the universe is in now. Considering only ourselves and our planet, we know almost nothing about mysteries such as the origin of life and how our brains work. There is much evidence of some great psychic reality that we are almost completely ignorant about. Unraveling how the mind works seems a thousand year project that we have barely started. 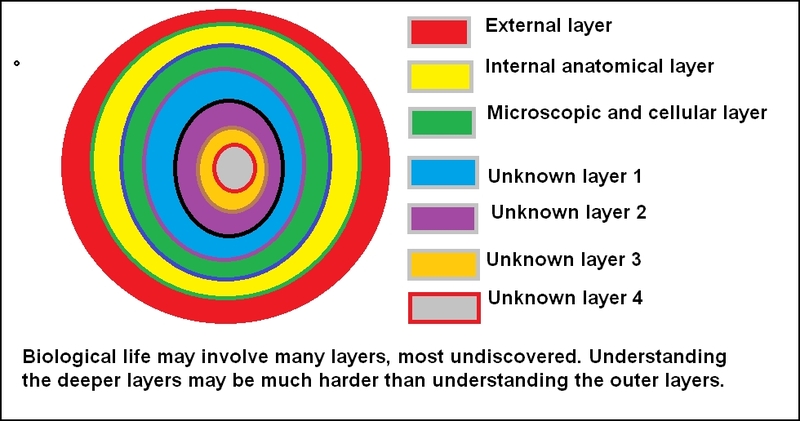 Given such realities, is it accurate to say that there are “gaps” or “cracks” in our knowledge? No, because such a term implies that we have learned a good fraction of what there is to know. If someone asked you how much you know about quantum chromodynamics, it would be most misleading for you to say that there are gaps in your knowledge of quantum chromodynamics (as that would imply you know a large fraction of that topic). You should instead say that you know nothing or virtually nothing about such a topic. Rather than speaking of gaps in our scientific knowledge, it is more truthful to say that our knowledge of nature is fragmentary, and that we have acquired only a few pieces in the vast jigsaw puzzle of nature. In the great million-year project of unlocking the universe's secrets, we are fledglings and newbies. Those who sell a story of scientific triumphalism often speak as if scientists are like college juniors or seniors with not terribly much left to master in the curriculum. But instead they (and the rest of us) are all like kids who have merely finished the first few weeks of kindergarten. Imagine a little child who makes a trip to the seashore. After he observes a few seagulls and fills up a bucket with shells, pebbles, and starfish, he may congratulate himself on his splendid progress in understanding nature. But ahead of him lies the vast and mysterious ocean, the mysteries of which he has barely begun to unravel. That little child is like humanity, which has so far accumulated only a few scattered fragments of nature's deep and mysterious truths, too vast in number to be enumerated. But it is easy to over-estimate how much we know, as the following little story illustrates. The chief scientist was a bright young person with lots of energy, so he trekked around the planet, for 10 years, making an exhaustive study of body shapes, skin color, hair color, and external differences in form. He then returned to the king, and triumphantly reported that he had found out almost everything there was to know about creatures such as himself and the king. So the chief scientist spent 20 years doing dissection of corpses, to learn about internal anatomy. He then announced triumphantly to the king that he had learned practically everything there was to know about creatures such as himself and the king. So the chief scientist spent 30 years doing microscopic studies. He then announced triumphantly to the king that he had learned practically everything there was to know about creatures such as himself and the king. Our scientists are often like this chief scientist, often tending to triumphantly declare their mastery of a topic when they have barely skimmed the surface of some subject with oceanic depths. The idea that Epstein is attacking is the doctrine of computationalism, the doctrine that the mind or brain is like a computer, and that the outputs of the mind and brain are like computations. I think Epstein is right to attack this doctrine. But the type of attack Epstein makes on computationalism isn't a terribly skillful one. Some of the points Epstein makes are rather dubious, and he neglects to make some of the best points that can be made against computationalism. Computers really do operate on symbolic representations of the world. They really store and retrieve. They really process. They really have physical memories. They really are guided in everything they do, without exception, by algorithms. Humans, on the other hand, do not – never did, never will. Given this reality, why do so many scientists talk about our mental life as if we were computers? A small part of this reasoning could be argued through a certain line of reasoning, but not one that Epstein attempts. It can be argued that our memories are not actually stored physically in our brains, that somehow memory involves some larger unknown, on the grounds that we have no understanding of how neurons can store memories. Some of the other claims, however, seem rather dubious. Humans operate using words, and words are “symbolic representations of the world.” When we memorize facts and then recall those facts (as a student will do when studying for a test), that is a process that can reasonably be described as storing and retrieving, even though we have no idea of exactly how or where those facts are stored, and can't even be sure that they are being stored in the brain itself. Epstein then argues at some length that humans are not information processors. This line of reasoning seems strange. Imagine you get a phone call from your friend, who tells you he is is stuck downtown because he ran out of money and doesn't have bus fare to return home. You get in your car to meet him downtown to drive him home. The phone call can surely be considered information, and your act of driving downtown as a result of that call can be considered processing the information. So why should we not think that humans are information processors? Similarly, when we simply memorize a fact, that can be considered processing a piece of information. The best way to attack computationalism is a way that Epstein seems to overlook: look for important aspects or outputs of the human mind that are completely unlike anything produced by computers. The way to refute the “your mind is just a computer” thinkers is not to argue “the mind never computes” but to argue “the mind does so much more than just compute.” So let us ask: what outputs does the human mind have that are not produced to any extent at all by computers? The first output I can think of is understanding. Humans have this, but computers do not. The most expensive supercomputer ever produced has never had the slightest understanding of anything. Given certain prompts, a computer can retrieve relevant information. But it understands nothing. Let us imagine American foreign-exchange students working at a big library in China, Americans who cannot understand spoken or written Chinese. Let us suppose that people come to an information desk of the library, with questions and information requests written in Chinese on slips of paper. Imagine that the American library workers cannot understand any of the questions, but have worked out a system by which certain information sheets or books (all in Chinese) will be given to those who have certain Chinese words (or series of words) on their information request slips. This is rather how a computer works. When you do a Google search for “United States,” some computer server at Google may be able to figure out that certain information items are to be sent back to you in response to this request. But that computer has not the slightest understanding of any of these information items, nor does it have the slightest understanding of what the United States is. And so it basically is for all computer processing. Every single time you ask a computer for information, it is completely lacking in understanding of what you asked and what the outputs are that it gave back to you. When you ask your computer what was the birth date of President Abraham Lincoln, it may very quickly respond: February 12, 1809. But your computer has not the slightest understanding of what a president is, what a birth date is, what any date is, who Abraham Lincoln was, or what a person is. What you see in this case is a correlation between a fact and the computer response. But we should not confuse a correlation with cognition. Computers have not an iota of understanding. This is one major reason why we should not be comparing the human mind to a computer. Another gigantic reason is that probably the essential output of the human mind is what we might variously call consciousness, experience, or life-flow: a stream of experiences of the type someone has when that person is consciously living a particular day. We can define life-flow as the stream of thoughts, feelings, and sensations that go on while you are awake, but which temporarily stop while you are sleeping. Such life-flow is the most essential output of the human mind. But computers have no such output. No computer has ever had the slightest bit of life-flow. It's futile to try to ask ourselves what it is like to be a computer, because computers have not the slightest bit of life-flow. So because it provides understanding and life-flow (also called experience), the human mind is something vastly more than just a computer (which has no such things as its output). Calling the human mind or brain a computer is like calling your smartphone a camera. Your smartphone includes a not-very-good camera, but it has vastly more (also allowing you to call people, run apps, play games, and browse the internet). Similarly it's rather as if the human mind has a not-very-good computer inside it, but its main outputs are things (understanding and life-flow) that are totally different from computer outputs. Although Epstein seems to err in trying to completely deny a computation aspect of the human mind, he is correct in suggesting the futility of all attempts to explain the human mind in a mechanical kind of way. One of the most sublime human emotions is the one we call awe. It's not very common for a modern person to feel it. 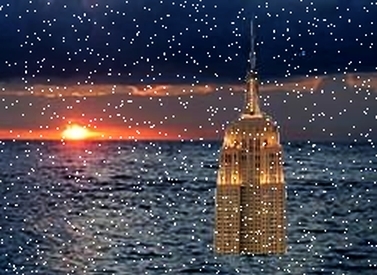 But imagine you are a New York City dweller used to seeing maybe two or three stars in the sky. Imagine you take a vacation in Colorado. You book a campsite in Rocky Mountain National Park. 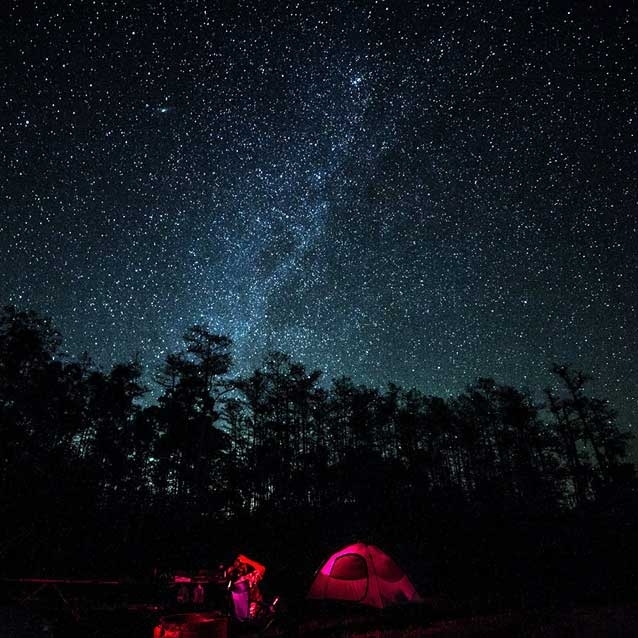 After nightfall you lie near your tent and look up at the sky. You are astonished. You can now see not just two or three stars, but thousands of stars. Plus you can see some strange faint band stretching across the sky. It looks like some ghostly river. You realize you are looking at the plane of the Milky Way galaxy. You suddenly feel a strange emotion you have rarely felt before. It is as if you have got in touch with some magnificent reality vastly greater than your little self. You experience an awe you will long remember. Why did awe became part of our species’ emotional repertoire during seven million years of hominid evolution? A preliminary answer is that awe binds us to social collectives and enables us to act in more collaborative ways that enable strong groups, thus improving our odds for survival. This hypothesis is unbelievable. Awe has nothing us to do with binding to social collectives, nothing to do with enabling social groups, and nothing to do with collaboration. Awe does nothing to improve any organism's odds for survival. We might be able to explain fear using a Darwinian explanation, on the grounds that an organism that is afraid of scary sights is more likely to flee predators. But awe is something different from fear. When you look up at a sky filled with stars, you feel awe, but you feel no fear at all. Nothing could be less scary than a distant star. My colleague Michelle Shiota had participants fill in the blank of the following phrase: “ I AM ____.” They did so 20 times, either while standing before an awe-inspiring replica of a T. rex skeleton in UC Berkeley’s Museum of Paleontology or in the exact same place but oriented to look down a hallway, away from the T. rex. Those looking at the dinosaur were more likely to define their individual selves in collectivist terms—as a member of a culture, a species, a university, a moral cause. Awe embeds the individual self in a social identity. This is rather hilarious. The skeleton was not even a real T. rex skeleton, but only a replica (probably something made out of plaster or plastic). Why would someone feel awe looking at some fake dinosaur skeleton? Participants first either looked up into the tall trees for one minute—long enough for them to report being filled with awe—or oriented 90 degrees away to look up at the facade of a large science building. They then encountered a person who stumbled, dropping a handful of pens into the dirt. Sure enough, the participants who had been gazing up at the awe-inspiring trees picked up more pens. 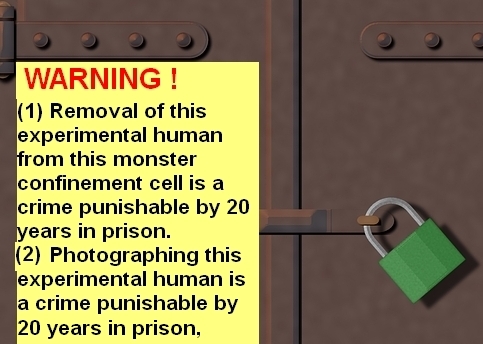 This is as dubious as the experiment with the fake dinosaur skeleton. Looking up at tall trees doesn't produce awe. Trees are too common to produce a feeling of awe. The fact that some participants may have reported that they felt awe (when presented with a questionnaire asking whether they did) is probably just a case of suggestibility or people reporting that they had a feeling that they thought they were supposed to have. Similarly, if you show a picture of a beggar to a man and ask if it makes him sad, someone who does not feel sad will often say he does feel sad, as a kind of act of social obligation or acting in the suggested or expected way. Since Keltner merely says that these tree gazers “picked up more pens” rather than saying they picked up “many more pens” (and since the paper linked to does not mention any specific numbers regarding this experiment or any level of statistical significance), we can assume the effect he is reporting is minimal or perhaps not even statistically significant. Such a result tells us nothing. At this link the experiment is described in detail, and the paper claims that “Participants who gazed up at the trees offered more help to an experimenter than did participants who gazed up at a building,” but offers no specific numbers backing up such a claim. So we must conclude the effect was minimal or marginal – for all we know, it could have been merely a “1% greater” type of effect. What we have here is rather silly psychology experimentation on a shoestring budget. To do a decent experiment on awe, you should do something like take people to the Grand Canyon or to a mountain place with crystal clear air where you can see 6000 stars at night. Then when you suddenly showed them the awesome scenery, they might experience awe. The experiment Keltner describes are “science on a shoestring” type of experiments that probably tell us nothing about awe, because they don't involve things that produce awe to a significant degree. It's as if the experimenters were too lazy to leave their local campus, and find something really awe-inspiring. I may note that inexpensive short-duration experiments like this are generally of little worth whenever they report modest effects or borderline effects (as in this case). If some college does a 2-year long study costing 5 million dollars, that has some weight, because presumably there would not been have time and money to try such a study multiple times and then report only one version. But it's a totally different situation for inexpensive short-duration studies. Let's say I'm a professor trying to show that wearing some color of shirt affects your test score performance. I could do 20 one-day studies (asking my students to wear a particular color on each of 20 test days), and then cherry pick a particular day, which ever day seemed to best support a “shirt color influences test scores” hypothesis. I could then author a scientific paper reporting only on that particular day's test. Of course, that really wouldn't give any evidence for such a hypothesis. I would just be making an inappropriate use of random fluctuations in test data. Also of little evidence value is a TV watching study described in this paper (Study 3), which reports only marginal results. On page 8 of the pdf, the authors report that they tried to experimentally induce awe by showing a “5-minute clip inducing awe, consisting of nature clips from the BBC’s Planet Earth series composed of grand, sweeping shots of scenic vistas, mountains, plains, forests, and canyons.” Such “eye candy” clips don't actually produce awe. If you see a real canyon, it may produce awe, but seeing one on television will not (unless you've never seen a canyon before on television, or unless you're watching a good science fiction showing some type of stunning scenery you've never seen before). Moreover, the procedure described in Study 3 is so convoluted that it is lacking in any evidence value. A supposed slight increase in generosity was measured by a willingness to donate points in some computer game, but the supposed difference in generosity involved giving away a few more points which each had a cash value of only pennies. Similarly weak from an evidence standpoint is Study 1 in the paper. Based on a very dubious analysis of a person's tendency to feel awe, the study reports a weak .123 correlation between awe and a tendency to give away imaginary money in a game. I need not say much about the weakness of that, other than to point out that a compelling correlation is one that is, say, something like .700. Even when correlations are much greater than .700 they are often coincidental. This web site lists correlations of greater than .900 between totally unrelated things, such as a .9925 correlation between the divorce rate in Maine and the per capita consumption of margarine. I find the experiments of Keltner and his colleagues on this matter to be quite unconvincing. It seems these are the type of results that anyone could get to support any random psychology hypothesis he wanted to support, just by doing 20 shoestring-budget short-duration experiments and then reporting the few in which random data variations best supported the hypothesis. Keltner tries to suggest that awe is something very social, but it isn't. Quite to the contrary, awe is the least social of all emotions. When you look at a sky filled with stars, you are absorbed in that external glory, and are least likely to be thinking about another human. Keltner's suggestion that awe is something that improved an early human's odds of survival is without any merit. Quite to the contrary, we should assume that awe is something that decreased an early human's odds of survival. Show me a caveman who spent quite a bit of time staring up at the stars with a feeling of awe, and I will show you a caveman more likely to have been killed by a predator while he is distracted by this activity that did nothing to help his chances of survival. Show me a caveman who spent quite a bit of time watching the sun set while he felt awe, and I will show you a caveman who would have been more likely to be killed by a predator while he is distracted by this activity that did nothing to help his chances of survival. Show me a caveman who tended to go out of his cave and watch a lightning storm with awe, and I'll show you a caveman more likely to have been struck dead by a lightning bolt. Show me a caveman who stood staring in awe at the big tusks of a mastadon, and I'll show you a caveman more likely to have been gored to death by those tusks. Show me a caveman fond of climbing mountains to experience awe-inspiring vistas, and I'll show you a caveman more likely to die in an accident while scaling such heights. There is no plausible Darwinian explanation for the emotion of awe, just as there is no plausible Darwinian explanation for numerous other aspects of the human mind – things such as musical ability, grammar ability, philosophical reasoning, spirituality, insight, altruism, and mathematical ability. As I argue here, these are things that do not increase an organism's survival value in a natural setting, and which therefore cannot be explained through a simplistic explanation of natural selection. We must postulate that something much more was involved in the origin of humanity than just random mutations and natural selection. If you have a spark of the divine in you, or a soul, you should probably expect that encountering some reality much grander than yourself might trigger some sublime emotion, something like awe. But if you were merely the soulless product of blind chance, you should expect no such thing. If blind Darwinian processes were all that were involved in our origins, you should expect that when you look up at a mountain sky of 6000 dim, distant stars, you should feel absolutely nothing. Genetic engineering was in the news this week. One news item was a National Academy of Sciences study claiming that GMO's (genetically modified food products) are safe. Given how financially entangled scientists are with GMO's, a study written by a committee of scientists may not mean very much. The 2015 scientific paper here is entitled "No Scientific Consensus on GMO Safety." I may note that declaring GMO's are safe (based on past results) may be like declaring that walking through a landmine field is safe, when you are halfway through the landmine field, on the basis that you haven't been blown up yet. Since GMO's are a continuous stream of new products, we can never be sure when the next gene-gamble product may blow up in our faces with devastating results. Also in the news this week was a secret meeting recently of 150 scientists and entrepreneurs recently at Harvard Medical School. The meeting was to discuss the outrageous idea of making an artificial human genome. This is something exponentially more risky than just creating genetically modified foods. I guess the secrecy of the meeting is a clue as to how things will work in the future, in regard to human genetic engineering. It will probably be very secretive type of work. The human genome has been compared to machine language, the series of 0's and 1's that are read directly by a computer, but are all-but-unintelligible to humans. In trying to change the human genome, our genetic engineers are like hackers trying to modify a billion bytes of machine language, a body of code which is almost entirely unintelligible. So it is inevitable that many mistakes will be made in the first attempts at human genetic engineering. We can imagine all kinds of shocking results: humans with a single eye above their noses, humans with mouths that are always wide open, humans with fin-like hands, humans with legs fused together, humans with heads that always droop down, humans without skin, humans with skin that sags down 4 inches, or humans with eyes that can only be opened with the fingers. 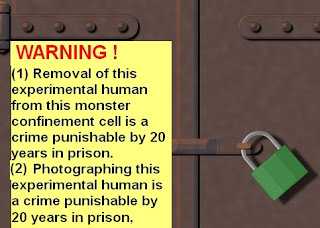 We can imagine how damaging it would be to a human genetic engineering effort if a single photo were to be released of a monstrous human body that was the result of faulty genetic engineering. So I imagine that those engaging in genetic engineering of humans will want to keep things secret. A single memorable photo can have a huge effect on public opinion, as was shown by that photo during the Vietnam War of the crying girl fleeing a napalm attack. But how will the human genetic engineers enforce secrecy? They might do that by making use of the national security apparatus which enforces such draconian penalties for revealing state secrets. 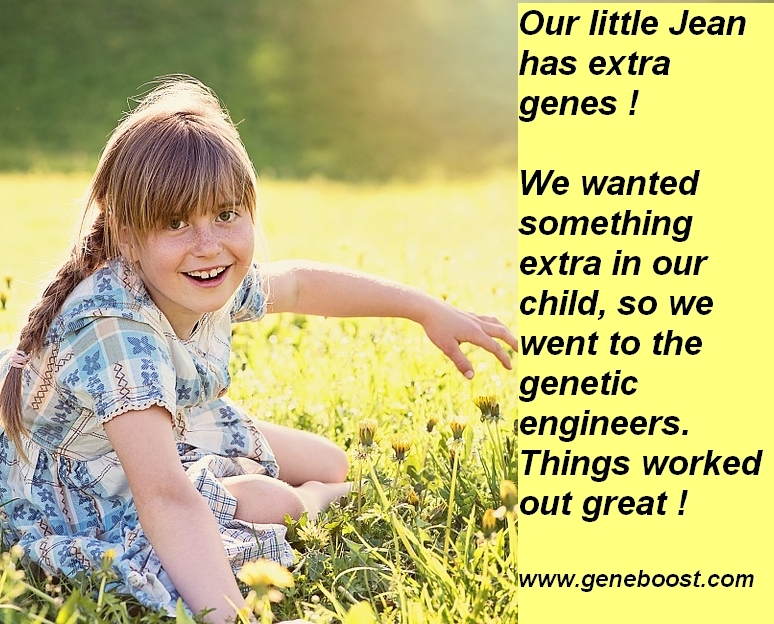 It might work like this: the human genetic engineers will appeal to the US government, asking that their efforts be declared a state secret, a secret important to US national security. You can imagine all kind of rationales that might be used. They might claim that the ultimate goal of genetically engineering humans was to create better soldiers, and that therefore genetic engineering of humans should be as secret as developing new types of fighter-jets or tanks. 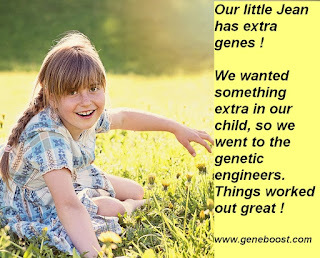 Once their efforts were classified, the human genetic engineers would have a way to cover up the unfortunate accidents that would be not-uncommon products of their efforts. Perhaps ugly mutants resulting from genetic engineering will be killed off to get rid of evidence of their existence. Or perhaps they will be confined to special confinement cells, hidden from public view. Anyone who photographed such monsters might receive a 20-year prison sentence, on the grounds that he had released classified government information that must be kept secret on national security grounds. Does it sound too far-fetched to imagine a future government throwing someone in jail for a long time merely for revealing ugly government secrets? I don't think this is too hard to believe, given that Chelsea Manning (formerly Bradley Manning) is now serving a long prison sentence, mainly for releasing to WikiLeaks an embarrassing video showing a US army helicopter carelessly gunning down civilians. The hideous truth of genetic engineering failures will be hidden from the public. In the future the public will see pleasant advertisements like the one below, which advertise cases of successful genetic engineering. On a blog that is part of the National Geographic web site, a blogger named Nadia Drake posted a post this week with the title “What Hillary Clinton Says About Aliens Is Totally Misguided.” I was surprised by this insinuation that Hillary Clinton had stated a position about aliens. Each day I have been following the presidential campaign coverage on cable TV – how come I had not heard anyone mention it? To back up this claim, Drake has a link to an interview in which Hillary Clinton says, “There’s enough stories out there that I don’t think everybody is just sitting, you know, in their kitchen making them up.” This is the only relevant Hillary Clinton quote which Drake cites. When I took a look at the interview, I found the relevant part was at 24:11. Here is what Clinton said after being asked about disclosing government UFO files. Clinton: I want to open the files as much as we can. If mean if there's some huge national security thing, and I can't get agreement to open them, I won't. But I do want to open them. Because I'm interested. Clinton: I don't know. I want to see what the information shows, right? But there are enough stories out there that I don’t think everybody is just sitting, you know, in their kitchen making them up. I think people see things. What they see, I don't know. Drake provides no evidence at all that Clinton has said anything about aliens. Her claim that Hillary Clinton has said something about aliens is therefore inaccurate. Contrary to her insinuation that Hillary Clinton said something about aliens in the interview, Clinton sounded entirely noncommittal, by twice using the phrase “I don't know” to indicate a lack of any position on whether aliens exist. Drake has misled us by both insinuating that Clinton stated some position on aliens (which she did not), and also insinuating that Clinton advanced some flaky position that is “totally misguided.” Her actual statements on the matter are noncommittal and perfectly reasonable to anyone thinking that the public should be well-informed. The misleading title of Drake's blog post is not the only fib Drake commits. She starts out her blog post with a lie. She says, “In the spring of 1999, a UFO flew over downtown Ithaca, New York.” After referring to this thing as an "alien object," in the second paragraph she again refers to this object as a UFO. But much later in her post she tells us that this object was actually an upside-down frying pan with a saucepan lid over it – something that she and a classmate had deliberately made to make a fake UFO photo – something she rigged up to a wire (so therefore an object which could not actually have “flown over” the city of Ithaca). The rest of Drake's blog post is an attempted debunking of UFO sightings, and it is one of the laziest attempts at UFO debunking I have ever read. Drake shows no evidence of having read up on any specific UFO incidents. She limits herself to lame armchair arguments and irrelevant reminiscing about her summer internships. Drake suggests that eyewitness testimony cannot be trusted, and says “check out the decades of research that have been done on the reliability of witnesses testifying in court.” Hardly a compelling argument, since we very often do send people to years in prison based solely on eyewitness testimony, because such testimony is in the great majority of cases largely correct. Furthermore, a typical UFO sighting will be written down very quickly, after a time gap much shorter than the months that often elapse between a crime and a witness testimony describing that crime in court. The fact that someone may make a mistake about identifying a face is no reason at all for doubting the accuracy of someone who claims to have seen a huge extremely bright object speeding across the sky (or a mile-long UFO, as at least 30 witnesses reported during the sightings at Stephenville, Texas). From an observational standpoint, a face is a set of fine details, but UFO reports are almost never reports of fine details – they are instead reports of extremely conspicuous deviations from normality in the sky. Since it is much, much easier to recognize extremely conspicuous deviations from normality in the sky than to recognize faces, any human imperfection in recognizing faces does nothing to impugn the reality of UFO reports. Drake then trots out the old skeptic slogan that extraordinary claims require extraordinary evidence. This is a silly slogan, and those who use it never specify what they mean by extraordinary evidence. In the case of UFOs there is, in fact, the most extraordinary evidence of close encounters. Some of the most extraordinary findings of science have been made by just piling up ordinary observations. There's no claim more extraordinary than the claim of the Big Bang, but the evidence that established it is just ordinary kind of evidence such as red shifts and a radiation reading from an unimpressive-looking device in New Jersey. If you were to claim that someone could levitate a rock, that would be an extraordinary claim, but you could establish it with ordinary types of evidence such as three simultaneous live broadcasts by local news stations, and sworn testimony by 20 witnesses. In her discussion of UFO evidence, Drake implies that it is “little more than unverified anecdotes,” which is a quite misleading statement given the massive photographic evidence (both still photos and videos) that have been made of UFOs. Photographs and videos are not anecdotes. As for “unverified anecdotes,” imagine if 30 people all reported severe stomach pains after eating at a restaurant. Until chemical tests were done, such accounts would be “unverified anecdotes,” but they would be a highly reliable indicator that something important and worthy of attention had occurred. My suggestions to Ms. Drake are as follows: (1) don't mislead your readers by claiming that a presidential candidate “says about aliens” something that is “totally misguided” when the candidate actually twice said “I don't know” when asked about whether she believed in UFOs; (2) don't publish photos of fake UFOs you have built; (3) if you do publish a photo of a fake UFO you have built, don't put a serious-looking caption underneath the photo making the phony claim that the object is a spacecraft; (4) if you try to debunk UFOs, try to show some slight indication that you have studied the evidence. The probe from another universe suddenly appeared high in the Earth's atmosphere, at an altitude of 10 kilometers. With a good portable telescope, you could see the probe as a strange glowing sphere in the sky. The probe continued to hang mysteriously in the same spot in the upper atmosphere. After weeks of anxiety, the visitors from another universe finally broadcast their intentions. At the White House, President Joe Hunt listed to the transmission that was picked up and broadcast worldwide. Do not fear us. We have come in peace. We offer great benefits to your primitive race. We can give you the solution to your most pressing problems. “Mr. President, can I have a word with you?” asked General Stack. You may think that we are visitors from some other planet in your universe. But we are not. We have come from an entirely different universe, a universe very different from yours. Our universe is not mainly empty space, like your universe. Our universe is almost entirely water. There is no empty space anywhere in our universe. “Mr. President, I must insist on having a word with you,” said General Stack. You may be surprised by how suddenly our probe appeared in your universe. This is because we opened up a space-time wormhole that allows instantaneous transport between our universe and your universe. So now we will be able to travel to your universe, and you will be able to travel to our universe. “Mr. President, don't you remember we launched nuclear missiles against that probe?” said General Stack. “What the hell – when did that happen?” asked the President. “But Mr. President, nuclear missiles cannot be recalled once they've been launched,” said General Stack. Ten minutes later, the nuclear missiles exploded in the upper atmosphere. The probe from another universe was blown up into a thousand pieces. Within an hour after the mysterious probe was destroyed, it started to rain very hard. It keep raining for the rest of the day. It was like a summer shower that wouldn't let up. The rain made the sad mood of the day even worse. When President Hunt went to bed, he assumed that the rain would be over by the time he woke up. But when he woke up the next morning, the rain was still coming down full blast. His advisers notified him of record flooding in Washington D.C. The full-blast rain continued throughout the day. Hunt wondered: is this some divine punishment for the destruction of the visitors from another universe? Hunt called in his science adviser, a man named Ed Fulton. “Water from a wormhole?” asked the President incredulously. Missile after missile was launched, but none of them did any good. The water continued to pour forth through the wormhole in the upper atmosphere, passing from the water-filled universe into the skies of planet Earth. The result was non-stop rainfall, like a summer shower that just wouldn't stop. Soon it was clear that all of Washington D.C. would be underwater. President Hunt moved the White House to the top of the new World Trade Center in New York City. He looked through the windows as more and more of New York City was submerged by the great flood. When it became clear that all New York City would be submerged by the flood, the President and some top aides got in a helicopter that took them to a base in the Rocky Mountains. Sad news reports came in of city after city being submerged by the flood. After several months it became clear that even the Rocky Mountains would soon be underwater. The president's helicopter left the mountain base, and landed on an aircraft carrier. With almost the entire country underwater, the only survivors were those living on aircraft carriers or other ships. On the aircraft carrier President Hunt gloomily walked the deck with General Stack. "How much food do we have on this carrier?” asked President Hunt. “Only enough to last us for eight weeks,” said General Stack sadly. A recent paper published in the journal Astrobiology has got quite a bit of online news coverage. Newsweek covered the paper with an article entitled, “Intelligent Alien Life Almost Certainly Existed Somewhere Else, Study Says.” The Newsweek article then says, “The new equation estimates a one in 10 billion trillion chance that humans are the only intelligent species to have ever existed.” But the paper actually estimates no such thing. A careful examination of the paper will show that it doesn't really clarify the likelihood of extraterrestrial intelligence. The paper estimates 2 X 1022 (twenty billion trillion) as the total number of stars in the observable universe. 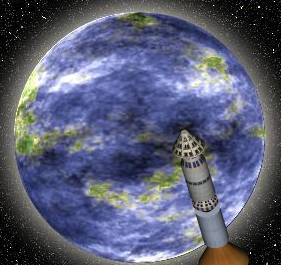 Using that figure, the paper estimates that if the total ‘‘biotechnical’’ probability that a given habitable zone planet has ever evolved a technological species is greater than about 1 in 2.5 X 10-24 (two chances in a trillion trillion), then mankind is unlikely to be the first technological species to appear in the universe. So what is that telling us? Nothing we didn't already know. We already knew our galaxy has about 200 billion stars, and that there are billions of other galaxies. Multiply 200 billion by, say, 50 billion, and you have a number similar to 2 X 1024 (two trillion trillion). So if the chance of intelligent life appearing on a particular planet is greater than about 1 in a trillion trillion, there will be many planets with intelligent life. But if the chance of intelligent life appearing on a particular planet is much smaller than about 1 in a trillion trillion, then we might be the only planet with intelligent life. Anybody could have done that math without reading this paper. Why, then, are the authors claiming to have reached a “new empirical constraint” on the number of technological species in the universe? Their paper really adds nothing. Since the Drake equation was created back in the 1960's, there has been only one relevant development. That development is that the “fraction of those stars that form planets” and the “average number of planets in the habitable zone of a star with planets” (referred to above) have been clarified – we now know these numbers are pretty high. But that development has been a gradual thing that has been decades in the making, so it's not like Frank and Sullivan should be having some sudden “Aha!” moment relating to that. I may note that Newsweek completely errs when its article states, "The new equation estimates a one in 10 billion trillion chance that humans are the only intelligent species to have ever existed.” In fact, the study doesn't even estimate a likelihood that humans are the only intelligent species to have ever existed. It merely states that if the chance of an intelligent species existing on an average planet is greater than 1 in 2.5 X 10-24 (two chances in a trillion trillion), then other intelligent species should have existed. 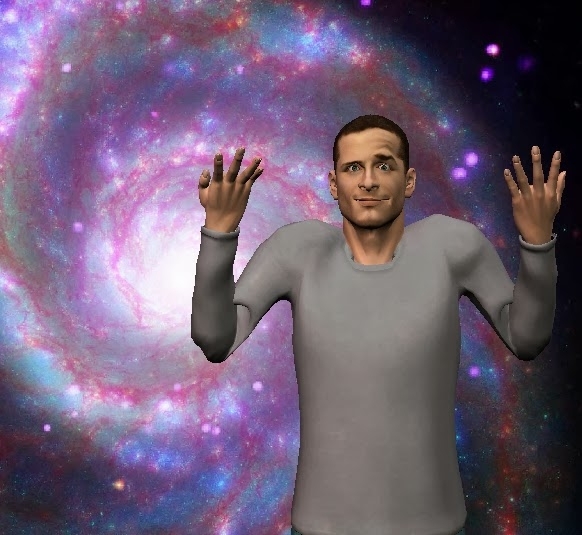 But the study does not estimate either that the likelihood of man being alone in the universe is only 1 in 10 billion trillion, not does it estimate that such a likelihood is less than 50%. Think of it this way. Before our result you'd be considered a pessimist if you imagined the probability of evolving a civilization on a habitable planet were, say, one in a trillion. But even that guess, one chance in a trillion, implies that what has happened here on Earth with humanity has in fact happened about a 10 billion other times over cosmic history! This probability of 1 in a trillion is never mentioned in the study, nor is an estimate of 10 billion other civilizations. As for the estimate of 10 billion other civilizations, this is just a case of “picking a number out of a hat.” The same thing used to be done by the late astronomer Carl Sagan, who used to estimate that there were 100 million civilizations in our galaxy. Such estimates are purely arbitrary guesses, very much “picking a number out of a hat,” because we do not understand the likelihood of life appearing by chance on a planet in the habitable zone. There is no basis for suggesting a probability of 1 in a trillion for a civilization appearing on a habitable planet. Given the difficulties of life getting starting from chemicals through chance events, it is still quite possible that the chance of life appearing on a random planet may be much less than 1 in a trillion, and even much less than 1 in 10 billion trillion – perhaps as low in 1 a billion trillion quadrillion quintillion. In the latter case we would be alone in the universe. Long story short, the Astrobiology study basically says that if we are alone in the universe, then it must be really, really hard for life to get started on a planet and evolve to a state where intelligent beings exist. But we already knew that. What the study does not do is give us any basis for estimating the number of extraterrestrial civilizations that exist, nor does it even show a likelihood that extraterrestrials have existed. There may well be reasons for thinking we are not alone, reasons pertaining to the desire of a Creator to avoid a “only one flower in the huge desert” type of universe, or reasons relating to sightings of UFO's, or reasons relating to a general but debatable philosophical principle that we should tend to avoid believing that incredibly improbable things happened locally. But the Astrobiology study does not provide any such reason, other than the “there's so many places where life could evolve” reason that has already been known for decades. Contrary to the insinuation of the Astrobiology paper (and its press release), our scientists still don't have any idea whether the rest of the universe is an empty desert or a universe teeming with life. The author suggests an absurd hypothesis: “Perhaps in the very moments that we experience a choice, our minds are rewriting history, fooling us into thinking that this choice—that was actually completed after its consequences were subconsciously perceived—was a choice that we had made all along.” Subconscious “rewriting history” in just a moment of time? Get real. Participants were repeatedly presented with five white circles in random locations on a computer monitor and were asked to quickly choose one of the circles in their head before one lit up red. If a circle turned red so fast that they didn’t feel like they were able to complete their choice, participants could indicate that they ran out of time. Otherwise, they indicated whether they had chosen the red circle (before it turned red) or had chosen a different circle. Unbeknownst to participants, the circle that lit up red on each trial of the experiment was selected completely randomly by our computer script. Hence, if participants were truly completing their choices when they claimed to be completing them—before one of the circles turned red—they should have chosen the red circle on approximately 1 in 5 trials. Yet participants’ reported performance deviated unrealistically far from this 20% probability, exceeding 30% when a circle turned red especially quickly. The author suggests absurdly that this little test suggests something about free will – that “it might be nothing more than a trick the brain plays on itself.” The experiment suggests nothing at all about free will. The experiment simply tells us minor stuff about human performance and memory that we already knew. When they don't have much motivation, people may perform poorly on tests that require concentration. People may perform poorly on boring tests. People may perform poorly on tests that ask them to do something they have never tried to do. People remember fairly well interesting or important things (such as a human face), but may have a poor remembrance of abstract things such as the position of white circles on a computer screen. People have a good memory for important choices, but don't remember well meaningless choices such as which of 5 white circles on a computer screen they chose in their minds. The fact that performance tends to degrade unpredictably when humans interface with a machine that is sped up “especially quickly” has been known since as least the 1950's, when it was demonstrated in this hilarious scene from the “I Love Lucy” television show starring Lucille Ball. Now given these facts, imagine you are some college student who has signed up for some test like the test described. You know that no matter how poorly you perform, you will get the same reward (which may be an hourly wage or perhaps some academic credit). So when the test speeds up, are you going to concentrate very hard, trying real hard to remember where those boring little white circles were on the screen? Knowing that it makes no difference whether you try hard, you will be just as likely to not try very hard (perhaps while the test is running, you'll be daydreaming or thinking about that pretty woman you saw last night). So when you see some little red circles popping up at a faster rate, there's a good chance that you'll just kind of “flip a coin” in your mind as to whether or not you specify that was the position that you previously chose in your mind. Knowing that the experimenter can't know which white circle you chose in your mind, you may be thinking to yourself, “No one will ever know.” Given a certain fraction of slacker subjects who are just lazily taking this kind of approach to the test, we would expect exactly the results reported. Even if we imagine no such slacker subjects, the results reported could be plausibly explained by simply imagining that humans don't do very well at remembering meaningless choices they have made, and don't remember well the positions of meaningless things. In fact, we're not even very good at remembering the position of meaningful things. If you ask someone to bring up an image of Brad Pitt, and then close the image, and then ask that person on which fourth of the computer screen Brad's head was located, there is maybe a 25% chance they'll give the wrong answer. The fact that there was an option in the test for specifying “I didn't have time to choose” means very little, because subjects would have a psychological aversion for selecting an option which might tend to identify them as slow-minded (a kind “I'm a slow dummy” button). The author's laughable suggestion that the predictable result of the experiment is an example of neuroscience telling us something about free will (that free will is an illusion) is just an example of pretentious glory hunger. Entirely lacking in such grandiose implications, the trivial experiment is so unsurprising that it deserves nothing but a yawn. 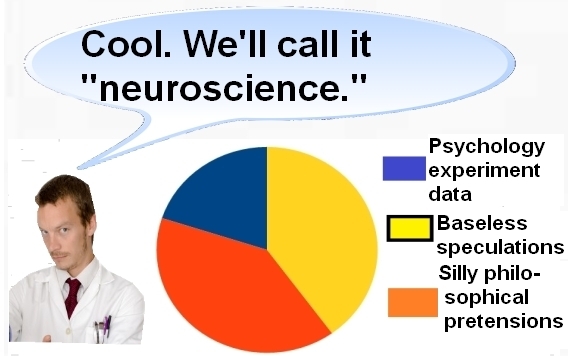 The experiment is also not an example of neuroscience, which the Merriam Webster dictionary tells us is “ a branch (as neurophysiology) of the life sciences that deals with the anatomy, physiology, biochemistry, or molecular biology of nerves and nervous tissue and especially with their relation to behavior and learning.” Doing little experiments like this (without monitoring of the brain) is not neuroscience, but mere garden-variety psychology experimentation. Psychology experimentation is soft science, and it should not be sold as hard science. The lesson we can learn here is that we should not assume scientists are always reliable interpreters of the data they collect. They very often are not. Given a choice between interpreting some data in a plausible way, and between interpreting the data in some implausible way that matches his philosophical biases, a scientist may choose the latter. Given its subtitle, you might not expect too much from John Hands' 2015 tome entitled Cosmo Sapiens: Human Evolution From the Origin of the Universe. In my mind the subtitle suggests the idea that humans have been around from the time of the origin of the universe, which is not at all an idea that Hands actually advances. But despite its unfortunate subtitle, and despite a few analytic missteps here and there, this large volume is overall a first-rate work offering an astounding breadth of learning, combined with some penetrating insights that puncture the explanatory pretensions of quite a few contemporary scientists. The task that Hands takes upon himself in writing this book is an enormous one: that of considering all of the great origin questions (such as the origin of the universe, cosmic structure, life, and the human mind), without taking any stock assertions for granted, trying to accept nothing on the basis of authority. Hands basically tries to take an approach like this: don't trust any of the generalizations of scientists, but always attempt to probe into the evidence claimed to support such generalizations, and attempt to see whether this evidence justifies such claims. Hands also seems to take an approach like this: always thoroughly examine alternative explanations besides the explanations generally recommended by scientific orthodoxy. This is a very refreshing approach, much better than the standard science-writer approach of trustingly regurgitating whatever “official party line” is fashionable among a particular group of scientists. How did we go from the Big Bang to something this ordered? Cosmologists often make assertions that have little scientific justification. Their language frequently reflects that of a belief system rather than that of a science, and the response of institutional cosmology to reputable scientists who have different interpretations of data or who advance alternative conjectures is too often reminiscent of a Church dealing with dissenters. Stasis and rapid speciation (the fact that species tend to appear quite suddenly in the fossil record, and then often show no signs of evolution for very many millions of years). Organismal enbryology and development. Hands notes that the orthodox model does not explain the mystery of morphogenesis, how a very tiny fertilized ovum at the moment of conception is able to progress into a human embryo and then into a human baby. Progressive complexification. Hands notes that NeoDarwinists often find themselves claiming that there is no arrow of progress in evolution, despite dramatic evidence of exactly such a thing, most notably in the origin of humans. This phrase “progressive complexification” is one that we might actually use as a two-word summary of the history of the universe. But our scientists have no unifying principle to explain such a thing. They have a unifying principle to explain how a universe might gradually fall apart (the idea of entropy), but no unifying principle to explain how the universe could go from super-dense particle soup to civilized beings. Isn't it time they started to suspect that the same thing driving the complexification of lifeless matter may be driving the complexification of biological organisms? Hands draws little in the way of original new conclusions, but that's no problem. His main job seems to be to show that our scientists know much less than they often claim to know, and that the great origins questions are mainly unanswered and still deeply mysterious. At this job he has succeeded admirably.